The idea of this Course was conceived in 1979 by discussions between Captain Chris Phelan, Director of what was then Southampton School of Navigation at Warsash, and James Paffett, who was in charge of N.M.I. (the National Maritime Institute at Feltham). N.M.I had been contracted to carry out Investigations into Shiphandling problems in the Suez Canal, when it was widened and extended to allow the passage of V.L.C.C.s. For this purpose two 1:40 scale wooden models were constructed. There was a model of the "Esso Bernicia", a 220,000 Dwt. single screw VLCC; the second model was of a 300,000 Dwt. twin screw VLCC. The Hull, and in particular the rudders, shafting, and propellers, were very accurately constructed to scale. Trials in the wonderful Manoeuvring Tanks at Feltham showed that VLCCs of these types could successfully be navigated through the Suez Canal, provided that skilled shiphandling and knowledgeable seamanship were used. On completion of these trials these models were no longer required by NMI. For some years prior to 1979, a successful Manned Model Shiphandling Course had been run by SOGREAH near Grenoble in France. 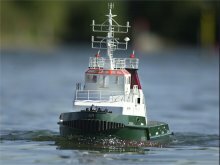 Based on the proven concept of Manned Model Shiphandling Training at Grenoble it was considered that a new facility should be established by Warsash utilising the two NMI models. Mike Longman, Principal Lecturer i/c Simulation was nominated as project leader. Mike's first task was to find a suitable lake; this involved looking at over 60 different lakes in the area. Eventually we were very happy to sign a contract with the Central Electricity Generating Board to hire their lake at Marchwood. 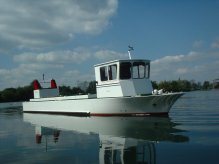 In the Autumn of 1979 the two model VLCCs were transported by road from NMI to Marchwood, where they were launched on the lake. Lecturers from the Ship's Bridge Simulation Section then carried out a series of Trial Manoeuvres on the lake. From these Trial Manoeuvres plans were laid to prepare the model ships and the lake for Manned Model Shiphandling Courses to start in the late Spring of 1980. It was decided that Lecturers for the Course would be provided from staff of the Ship's Bridge Simulation Section. Covering the whole outside of the wooden hull with fibre-glass sheathing. Providing Wheel and Telegraph Controls in the forward manned position for control of the ship's rudder and propeller. Appropriate realistic time delays were fitted. 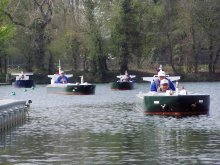 The task of preparing the lake for manned model operations was given to Mike Ward, which he progressed throughout the winter months. This task required much thought and practical effort; also money was tight. However Mike had an amazing knowledge of where various fittings could be obtained at very favourable rates, he wasn't known as "the Portsmouth Gipsy" for nothing. The lake had to be surveyed, shoal areas marked, and artificial buoyed channels laid. Many of these original channels, including the dreaded "Y" are still there today, and bear witness to Mike's breadth of vision. It was decided to name various features of the lake after Lecturing staff; thus we had "Ward's Island" and "Longman's Passage". We wanted to name a tricky channel in the south-west corner after Captain Chris Phelan - "Phelan's Bottom" was suggested - however that formidable individual stated in no uncertain terms that he was not having hairy mariners told to proceed into Phelan's Bottom! We compromised by calling the channel and shoal area "Phelan's Flats". It was interesting that no one seemed concerned about mariners being told to proceed up "Longman's Passage"! In May 1980 great activity took place to finish preparations of the lake for the first Course. 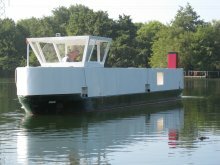 One floating pontoon was installed to serve as a berth- other berths were on order. A Caravan was borrowed from the Sail Training Association to serve as a Lecture-room. Charts of the Lake and Course Notes were provided. Two dinghies were obtained to enable Lecturers to follow the ships around the lake; they were launched one Saturday morning by a highly skilled working party of 5 Master Mariners; unfortunately no one of this talented team checked that the "plugs" were installed! The plugs found and inserted, the boats bailed out, and finally we were ready. Initially it was intended that the Lecturers on Course would be Mike Longman, Mike Ward, and Bill Bayley; Bill Bayley's input during the winter months of preparation had been critical, as he had recently joined the staff after many years as a Trinity House Pilot, and his expertise in practical Shiphandling was invaluable. Unfortunately Bill's health did not allow him to take on practical duties on the lake, and I was brought in at the last moment. 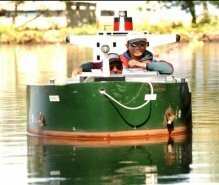 Mike Ward fitted very well into our concept of a suitable Lecturer for scale-model ships - being fairly short we described him as a "scale-model Lecturer". During our first season in 1980 the Mariners on Course were all deep-sea Officers from the country's major tanker operators. They all benefited from the chance to experiment realistically with the practical problems of handling a very large ship. The initial facilities were very basic - I still remember our devoted technician John Frost crouching on the pontoon in the middle of the lake in the pouring rain, charging the ships from a portable generator, and attempting to avoid short circuits by covering the terminal connections with his own oilskin. The Lecturing staff, compared to today, were 'Very green" in knowing how to fully utilise the advantages of manned models; however we were all experienced mariners, and we did learn quickly. But what made the Course so successful was the attitude of the Mariners on Course - they all seemed to strike the right balance between serious concentration and practical enjoyment. With the lease coming to an end at the Marchwood site in November 2010, staff started to search for a suitable lake in 2007. Many lakes were looked at. Eventually a lake was found for sale at Timsbury, Hampshire. This was only 10 miles to the north of the site at Marchwood. With remodelling, it was thought to be ideal, being situated in woodland, which afforded good shelter from the wind. The last course run at Marchwood was a 2½ day course finishing on the 10th November 2010. The models were then prepared for transportation to Timsbury, where they arrived on 24th November 2010. Remodelling Timsbury Lake and the building of a purpose built teaching block and workshop commenced in September 2010, and completed on April 11th, when the lake was handed over by the contractors Morgan Sindall to Southampton Solent University. The first course commenced on 2nd May 2011. The Admiral The Right Honourable Lord West of Spithead opened the new £2.7 million centre during a special ceremony on Tuesday, 21 June 2011.